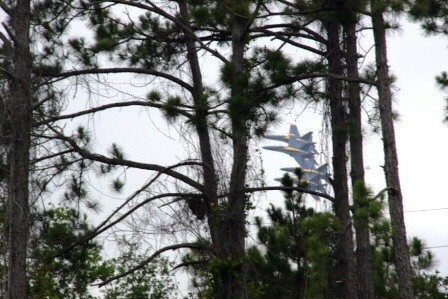 From I-10, exit 7A to Pine Forest Road, to Blue Angel Parkway to NAS Pensacola. Follow signs to the National Naval Air Museum. Campground is on base. Enter the base from the back gate off of Blue Angel Parkway onto Radford Blvd. Watch for small sign pointing to the campground. 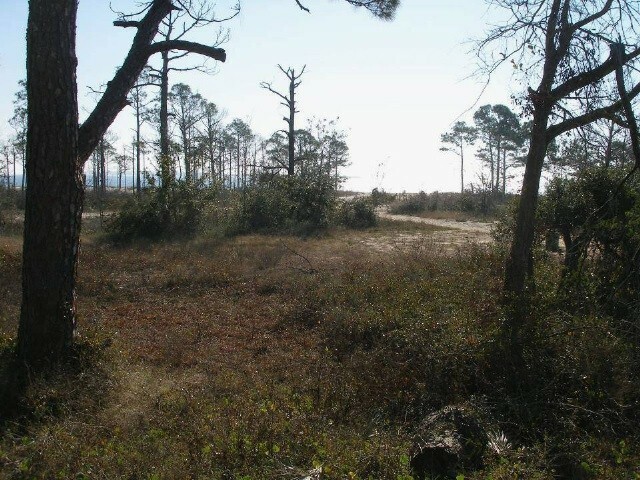 The campground is .5 miles West of the lighthouse. Required, with 2 day non-refundable deposit. 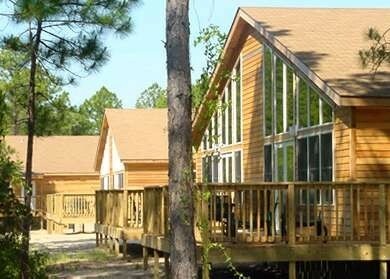 Cottages can be reserved 3 months in advance for military and 2 months in advance for DoD. Camping can be reserved up to 1 year in advance for active duty and 6 months in advanced for retirees and DOD civilians. Free WiFi available in the campground. Allowed with normal leash and clean-up rules. Pets NOT allowed in the vacation rentals. Camping higher rates are for DOD civilians. Extended camping stay rates are available (call). One and two bedroom cottages available. 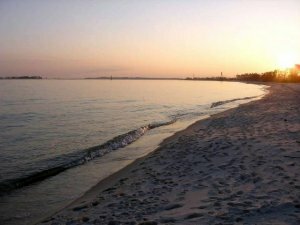 Walking distance (.8 miles) to National Museum of Naval Aviation and (.5 miles) to the Pensacola Lighthouse. 14 day stay limit in water front sites - 90 stay limit for all else. Must leave for 2 weeks before returning. Overflow only available to unaccompanied active duty. Recreation Equipment Rental, Camping Equipment Rental, Water Sports. 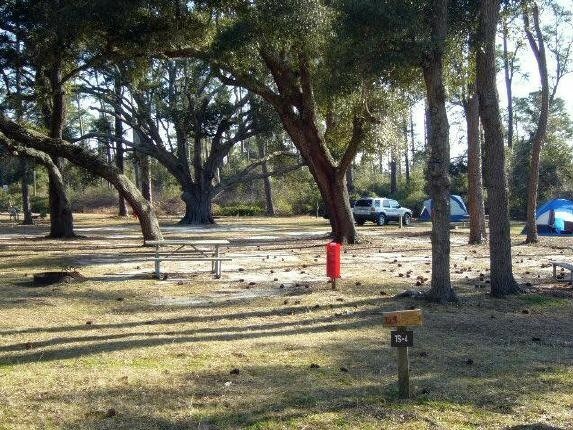 Oak Grove Park Campground is nestled in the oaks, within walking distance of the beach and the National Museum of Naval Aviation. We stayed here a couple years ago and again this past week. It was good the previous stay. It was excellent this time. First off , the directions listed above bring you to the back gate, where you need to enter. Once though the gate it is a straight shot to the campground. Look for an orange and white plane on your left and campground is directly across from it. Check in was super easy and Lisa is still working in the office. Friendly, cordial and informative. Great gal! We were in site 41 near the tent camping area. Site was level, clean and plenty of space for our 38' Class A. On our previous visit the cable wouldn't work and the WiFi was iffy. This time both were working perfectly with no problems. The bathhouses were clean and kept well. A short walk through a path from the campground to the beach. One note, the commissary and exchange are off base. No complaints and will surely return. Follow the directions given on this site. RV sites can be a little tight but doable. Short walk to a nice quite beach. WI-FI was weak and cell service was ok.
Not quite what we expected from the photos. A little tight but maneuverable. No pull thrus. No real pet run except for path to beach. Most guests just go out to front of park along the road. The staff was friendly enough and didn’t bother us. The camp host stands watch from his MH most of the day but is friendly. No plans on staying here again. Blue Angel park seems like the better park to stay at. We checked it out and will be our choice next time. Just make sure you have reservations! 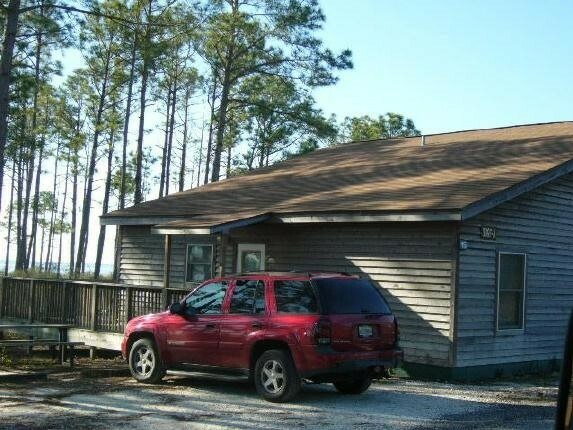 Pros: * Many spots are pull through * Super friendly Camp Host * Nice Walking Trail to Beach * Well maintained bathhouses * Easy booking, easy check in Cons: * Had a hard time finding this place, ended up driving all over the base and having to call the Navy Lodge for directions (Trust but verify your GPS) * Wifi signal is weak * Campsites feel close do to minimal tree coverage (but that helps keep down bugs) Overall a great stay, we were only there for one night. We look forward to heading back to the area to explore more of Pensacola. Cleanest park I have stayed at in a long Time. Host friendly and helpful. Check in quick and easy. Loved the park. We spent three days/two nights at this campground. It was our first time. We loved this place! Imagine getting up and watching the sunrise on the sand with a cup of coffee or watching a spectacular sunset over the ocean. The access path to the sand was one campsite away from ours. 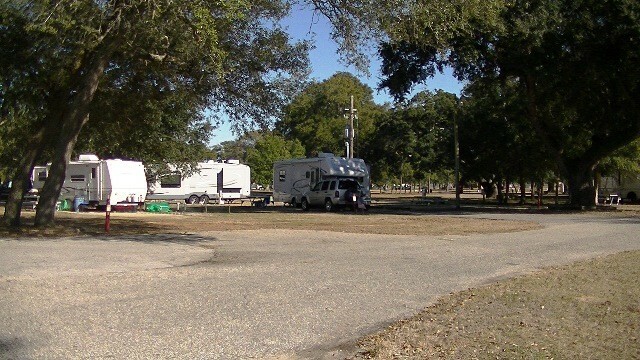 The campground pluses included cleanliness of the sites and bathrooms; space of and between the sites; ease of hook-up for electric, water and sewage; and the professionalism and friendliness of the staff even when dealing with unreasonable campers (as we observed first hand while waiting to register). 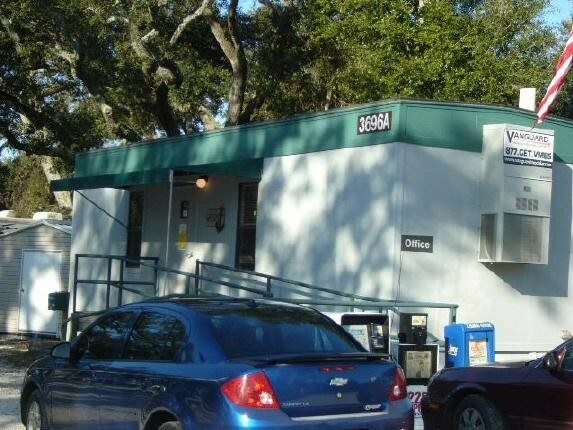 Don't expect to show up without a reservation for this military campground (or many others) and find a space for more than one night. Plan ahead! We made our reservations early enough that we were able to secure a site by the water. The campground needs to improve WiFi access. Having to use a computer in the community room is not acceptable. It was not accessible from our site even with a WiFi Ranger signal amplifier that we have installed in our trailer. We had to use our Smartphone as a hot spot. My recommendation is to install better WiFi in the campground so people can access email, websites, and, for some of us, work. 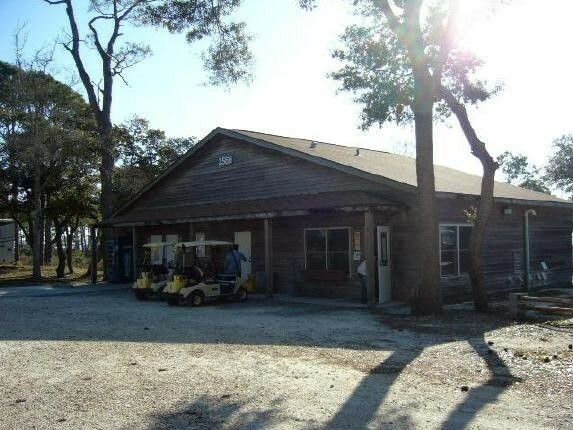 As for activities, there is a community center for folks to get together and meet other campers. There is an air museum on site as well and a beautiful lighthouse. The NAS has the usual amenities as most other bases. The Pensacola area around this base has many restaurants, shops, and other attractions for both adults and kids. This is a campground that I would return to time and time again. It is a tough challenge to add anything new in a review for Oak Grove Park. 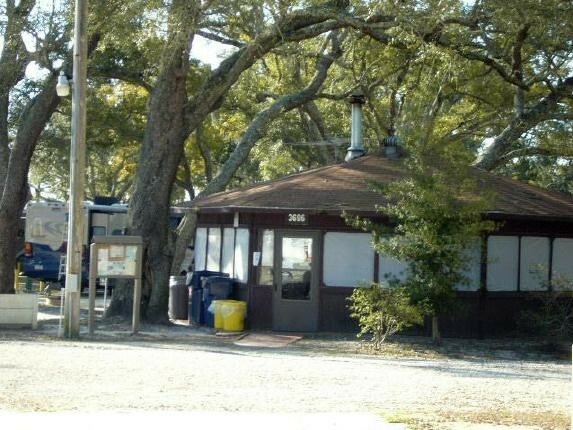 There are many reviews that give a good explanation of the oak tree shaded, beachside park. I especially liked OLD NAVY’s review of Jan 16 -30, 2017. Oak Grove is the 2nd Navy RV Park out of 5 that we made reservations through the online system. It [reservation system] worked great, the park was ready for our arrival. Check-in was easy, friendly and informational. Like most MCG’s you get a handful of paper with various types of information - Oak Grove is no different. The green pamphlet has been the most useful one for us. It contains maps of the base and the surrounding Pensacola area. 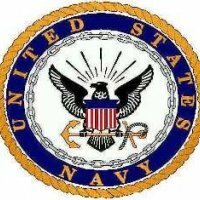 In addition to the Navy-wide reservation system, we could logon to the Navy-wide GoWiFi system using the same user ID and password we used at other Navy RV parks. There are WIFI extenders located throughout the park. We had no problems with the WIFI system and response time was good. The 40’ x 20’ cement slab should be the norm for all MCG’s. The slab is large enough for an RV with multiple slide-outs plus enough room for outdoor activities, regardless of the location of the door on the RV. The parks interior streets are gravel which cause the front end of some slabs to get a little messy when it rains. We had a great time staying at Oak Grove Park. It is quite a sight to watch the Blue Angels flying their air show routines. We will return. My wife and I booked this campground for July 1-8, 2017. We left after the 2nd night. This was in no fault of the campground. We left because the campground is located within the guard checkpoints of the NAS and we brought our motorcycles. It was our fault for not checking on the required riding gear for the NAS. We did not have all the gear needed. That being said, the day and half we were there, the park was clean but tight with some neighbors and spots, the bath house was clean and roomy. The parking pads were concrete and level. The camp host was extremely friendly and nice. The beach is within walking distance. Signs say no swimming but there were a lot people swimming. 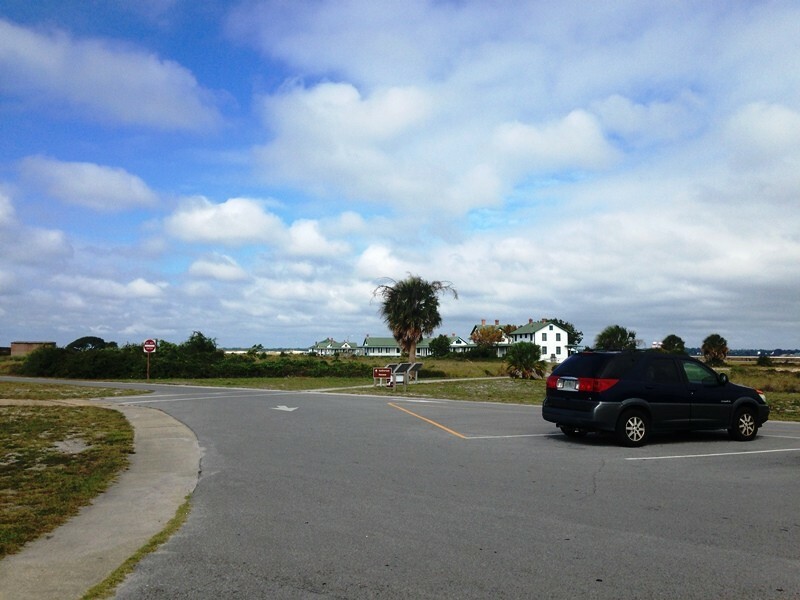 The lighthouse and Naval Air Museum is a must see and is a nice walk from the campground. We would stay there again but only if we brought a car and not our motorcycles. This park has a rat problem! A box with dead rats was discarded along the service road, and dead rats were in the grassy field by the park's entrance! This was very disturbing to say the least. That said, we have stayed here many times over the past two decades and never experienced this infestation in the past. The campground is rustic but acceptable. Rates are a bit high in comparison to other military parks, considering they have nothing on-site in the way of recreational amenities. Laundry and restrooms are clean and well-maintained. A wonderful Campground. Stayed two weeks and the prices above are correct. One can use this facility on a weekly basis. We carry a modem with us so we had no problems using the WiFi and the modem gave us complete security when on line. The Navy Exchange Gas/Mini Mart has started carrying limited supplies if you run out of something for your camping experience. The Naval Aviation Museum is not a one day event...it will take two to three days to see everything. 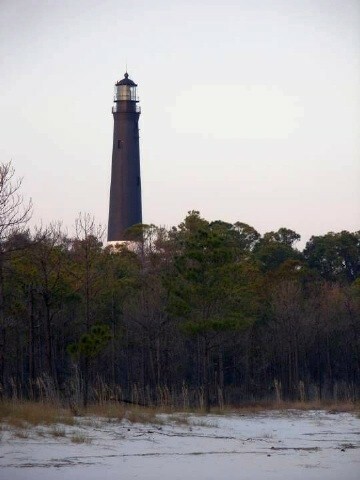 The Pensacola Lighthouse is the tallest on the Gulf. If one has a weak heart or diabetic don't try to climb to the top. The Light keepers residence is a nice Museum in itself and provides a lot to see and learn. There is a bike trail the goes next to the Campgrounds and another hiking trail that runs parallel to the bike trail, but separates down by the light house. The pads are very large concrete sites. Plenty of room for my 31foot Class "C" and our towed car. 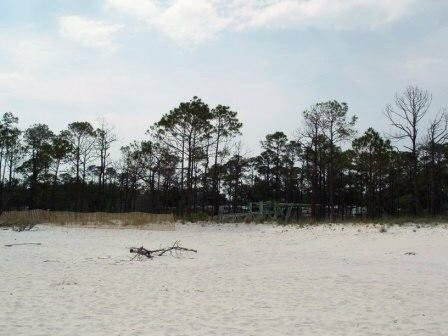 The Campground Hostesses and Campground Staff were very friendly and helpful with their knowledge of Pensacola. I look forward to going back next year. If any concern I may have is that they use five or six inch steel pipes concreted into the ground to mark the campsite number. They are painted dark red. Very seeable in the day time, but almost impossible to see at night. Before backing in stop, get out and locate these. RV vs Steel pipes = Steel Pipes win. I do not know of any incident while I was there and not even sure there has been a RV backing into any of them, however I did notice a couple of the pipes leaning to the side for some reason. Your stay will be a lot more fun if you avoid these critters. A neighbor arrived well after dark and the Campground Hostess was with him and carried a big flashlight to assist him in backing in. You can't ask for more. Stayed in pull-thru site. Sites are close, but I think that is the Florida way! Lot of trees but luckily there is cable! WiFi not the best, but that is to be expected with so many people on it. 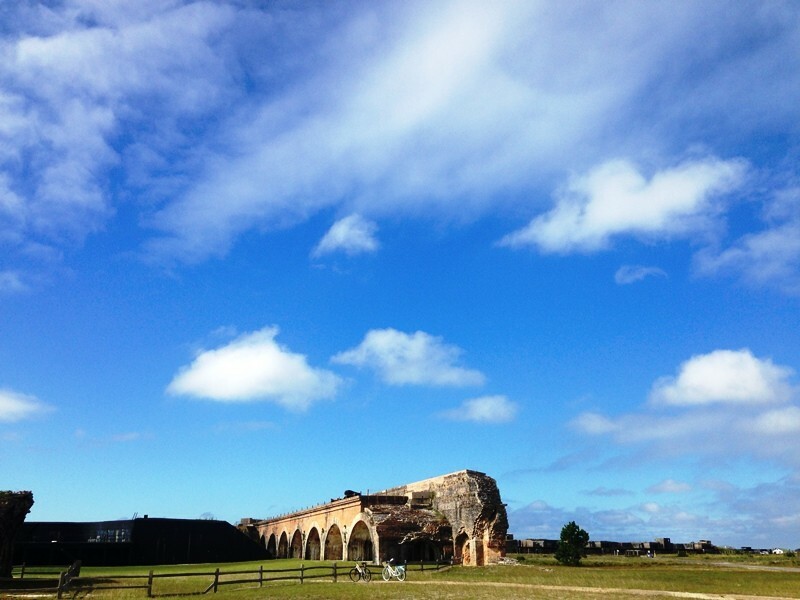 We found it to be convenient to many things - those on base include the awesome Naval Aviation Museum and IMAX theater, the Pensacola Lighthouse, Fort Barrancas, and the beaches. 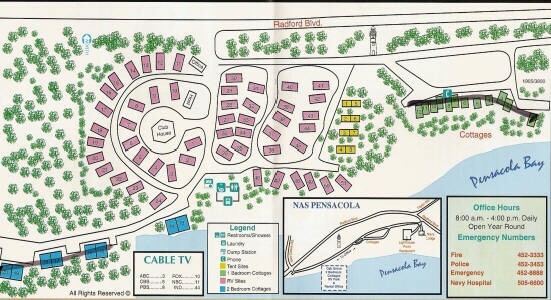 The Navy Exchange and Commissary are located at short distance off the base, but easy to find with the great directions provided by the camp hostess. Planes fly over during the day and sometimes at night - this is a training base for pilots, so it should be expected. But, it wasn't bad - we tuned them out after a day or two. FYI: We were told by CG office staff that there is NO WEEKLY RATE, only daily or monthly rates and that this has been so for a few years, so the rate info above is not completely correct. 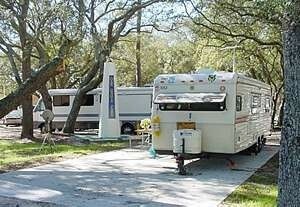 We have a regular RV site (not waterfront) and it is $23 a day. Also, effective Sep 20, 2016 you cannot reserve a site by calling the phone number listed above. ALL reservations must now be made through 1-877-628-9233 or www.dodlodging.net. If you are trying to reserve a site the same day as arrival, they will transfer you back to the CG office (but won't give you the direct number). Make sure you have the agent stay on the line until the transfer goes through however, as we were hung up on twice before it worked. 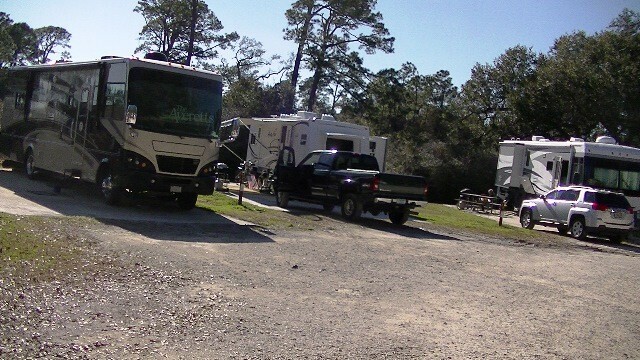 Now for our review: This is our first visit to this particular campground in our RV and we are pleased so far. The office staff and the camp host are pleasant and helpful. 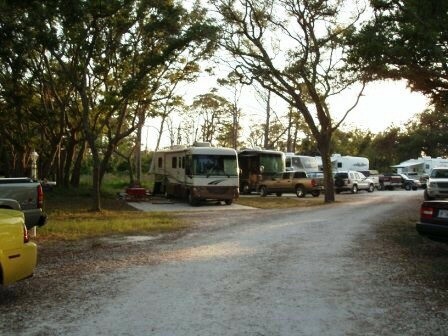 The sites are close, but not overly so, and we had no problem parking our 34' motorhome and our toad on our site. The pads are large concrete pads and we have full hookups. The WiFi works well, the digital cable is also great. 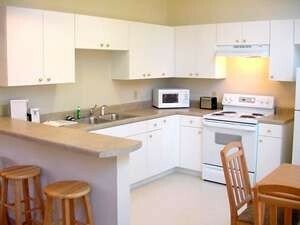 The laundry room has many front-load washers and dryers and is very clean, as is the bathroom. There aren't a lot of activities on base compared to some other CGs used by snowbirds (like Key West, for example) but there is a very nice theater just a few miles drive or bicycle ride away, and there is the Navy Aviation Museum and Pensacola Light house within walking distance. There is a also a nice paved bike and walking trail right at the CG entrance, and non-paved hiking or walking trails all around. And of course, the beach is within a short walking distance of the CG, with some sites having a bit of a view of the water. The beach is beautiful, with white sands and clear water. No swimming is allowed right off the CG area, but you can swim further down the beach within walking distance. We saw a 3-4 ft shark as well as moon and pink meanie jellyfish in ankle deep water, so be aware and watch where you step if you stroll barefoot in the water. All in all, a great place to relax! This was our second visit. Very pleasant stay, nice people, within walking distance to beach, trail, lighthouse and of course, the magnificent museum! We didn't use restrooms/showers/laundry, so no comment. Not sure what I can add that hasn't already been said, but my Wife and I were here in May 2016 for the very first time and absolutely love this place. The Staff and all the people are so friendly and helpful and the CG is very well maintained. I'm a 100%'er and the walk to the museum was a little too far for me, but we made an all day excursion out of it and it was well worth it. The first morning we had the Blue Angels practicing for about 2 hours right over the CG, what an experience, got some great pictures and it was like having our own private air show. Everything works as advertised, the beach is a short walk away, the swimming beach is a little further down but still within walking distance and we really found nothing wrong with this place. I hope we will be able to come back many more times! Very nice park we stayed for 3 night. Beach is close but is closed to swimming. We asked to change sites their was 3 or 4 open but were not allow to move. Great Naval Air Museum with in a mile. Very nice laundry facilities. Great campground. As of 2 weeks ago, WiFi is now free at the campground & works great. Also has 91+ digital cable channels. Stayed for four nights in site #9. Pad was level and hook-ups worked well. Staff was friendly. There is a great paved road with very limited vehicle traffic right at the park entrance that is great for walking and biking. Even though we had over 9 inches of rain during out stay we found plenty to do in the area. Be aware that the commissary and exchange are about a 20 minute drive of base. The is a Walmart and Target just outside the gate you come in that will meet your needs if you don't want to drive to the commissary or exchange. Hopefully will return in the near future with less rain. Great park with a short walk to the beach. Courteous staff, clean, nice place to stay. Only negative is no NEX within close walking distance. Looks like a great park! I say 'looks like' because we spent most of our two days there either inside our RV or at the Naval Air Museum thanks to the remnants of Hurricane Patricia that had 40+mph sustained winds and seriously heavy rains. We drove around the facility on our way to the NEX/Commissary a few miles away at Corry Field (Deb at the office gave us a map and helped us with extending our reservation an extra night). I'll agree with the other reviewers comments regarding poor signage - especially at night and in the rain! That said, once you have an idea where you are going (or have a good GPS app) you can get around easily. We arrived at the main gate as the back gate is only open limited hours. We didn't use the facilities due to the weather, but they looked good from a distance. Utilities worked fine, although we did lose power at the museum for an hour during the storm (uncertain if it affected the campground, but probably did), water pressure was fine as was the cable TV service (to windy for me to put out our Dish). We certainly look forward to coming back, just keep in mind you can't reason with hurricane season. Our second stay to visit our daughter who is in training here. Weather a bit cooler but one of our favorite campgrounds. This time with fall temps the water is nearly crystal clear, such a change from the summer brown. 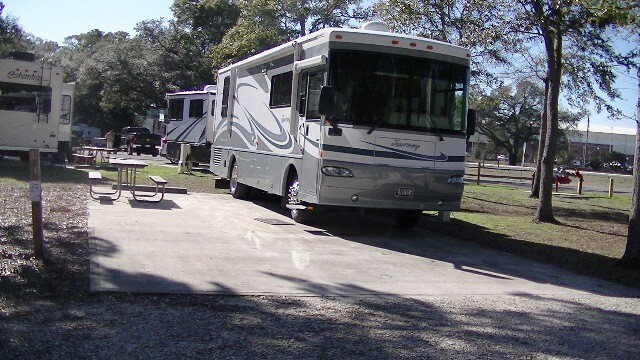 Camp hostess Deb came to our rescue and recommended Blue Angel Tire and Automotive out the back gate for us. We needed some repairs on the RV and they took us right in on a Monday morning. Doesn't get any better than that. Such a pleasure to have a laundry where all the machines are in working order and a change machine. Rest rooms are kept clean too. We camped in a 32' motorhome with tow dolly and car.